They were willing to align themselves with anyone. They realized that they needed a major imperial backer to establish a state in historical Palestine. They talked to "all" the major powers about this. The following award winning film illustrates the situation in the West Bank in by setting it in London. This shows the effect of an extreme case of borders on working class people. You don't need to be soft on Israel to be an Anarchist. No one here is. Show me one example of any poster on this site being 'soft on Israel'. It's obvious that you're locked into a false dichotomy where the only options are supporting either Israel or supporting Palestine. The correct answer is c none of the above. I can see that to say "none of the above" can be ideologically correct. Progressive politics though should be based not only on theory , but also on practice. I would be very surprised to be told that this pamphlet was written by anyone who has acted with the ISM; it seems to have little understanding of the situation in Palestine. I urge the authors to visit Palestine for themselves, not so much to promote their ideas as to challenge them. If you are claiming that the AF hasn't been involved with anti-war activity around Israel/Palestine you are badly uninformed, as we've been heavily involved in demonstrations and occupations and have had members visit Palestine with the ISM. Israeli Minister Efraim Eitam called Palestinian citizens of Israel a "ticking bomb" and a "cancer". That is the assumption that underlies this pamphlet and that is why I disagree with it. I did not mean to suggest that anyone should support Nationalism. Supporting peoples rights to defend themselves and to return to farms they have been ethnically cleansed from is not supporting Nationalism. Pretending; as Freedom Press does; that those farms were irrigated from the desert by anarchists; is. I've been with the ISM twice and I am in almost 100 percent agreement with the AF on this (and I was in touch with Django while they were writing it, although my input was minimal at best). If you've actually read it you would see that the the AF does in fact support the struggles of the West Bank villages. These struggles, however, are livelihood struggles. The demands of villages like Bil'in, Na'lin and Biddu (and Budrus where the villagers actually won their struggle) are all about being able to make a living. Fascism vs. democracy. What the pamphlet is saying is that both are simply incarnations of capitalist management systems of the nation-state. In cases of conflict they act in just the same way. Israel is a liberal democracy by most definitions (and it is only for that reason that Budrus got their land back, thanks to the Israeli liberal justice system), just as the UK and US. This does not stop any of these states acting like the most vicious totalitarian states in the countries they've occupied. You do realize that Efraim Eitam is no longer a minister, and was only in the government between 2002 to 2004, and wasn't very prominent even then? If anyone's out of the loop, it's you. Honestly, if you want a slide into direct fascism, you need look no farther than today's Foreign Minister, Avigdor Lieberman, whose rejected proposal for demanding that citizens be required to sign an oath of fealty or their civil rights will be revoked has been a major part of his election campaign. I live in Israel, I follow the news, including the alternative sources, and have personally been to the West Bank on a few occasions, and I have seen nothing to "challenge" this pamphlet - on the contrary, my experience seems to confirm it. It would be nice if you had any material objections to it, rather than questioning the worldliness of its writers. Show me one example of any poster on this site being 'soft on Israel'. Boycotts of the goods of one of the antagonist nations (for example in the repeated calls for the boycotting of Israeli goods) have little effect, despite the positive feelings that ‘doing something’ might entail. Please follow the link before reacting that we do not see a utopia in South Africa; I agree that there is still Apartheid in South Africa but this is not a reason to oppose solidarity. The link also includes arguments from Omar Barghouti; a founding member of Palestinian Campaign for Boycott, Divestment and Sanctions; that there is documented ethnic cleansing; and from Tarek Mustafa, "The strike leader of Egypt's first independent trade union". So the boycott gave moral support to the ANC in its time of trouble. Now the ANC is at the head of a state under which working-class blacks are doing even worse than under apartheid and which was asking the same white rich who fled the country when apartheid was overturned to come back in. Aside from moral support to a specific resistance group which later turned master itself, what tangible help was the boycott to black (or any) South Africans? workers strike movement to come to the fore back in South Africa. And I can tell you in that period, real difficult period, when our people heard of Irish shop assistants going on a strike, refusing to handle South African goods, it came as a tremendous inspiration! I think you find that this is a form of workers solidarity, and whilst it is fine to called it a boycott, this term generally refers to consumer boycotts which are different things altogether. I think the pamphlet is pretty good in historicizing and explaining the rise of the nation state and nationalism. And I really appreciate your principled opposition to the nation form and your critique of national liberation. of the working class to be overcome. struggle anarchism will never get us anywhere. rhetoric of class struggle universalism if they want to be convincing. exactly, you wouldn't generalise about an ethnic group like that, because it would be stupid and obviously racist, so how can you generalise about an entire gender like that? you wouldn't generalise about an ethnic group like that, because it would be stupid and obviously racist, so how can you generalise about an entire gender like that? an exaggeration, yes, but false, no. most forms of gender oppression occur in more subtle ways, and gender inequality occurs in structured forms of the economy. you know this. i think the comment was meant to bring attention to this absence. hope the exaggeration doesn't prevent one from addressing the legitimate comment. i think the comment was meant to bring attention to this absence. the thing is, it's a pamphlet on nationalism, so criticising it for not addressing a different subject is a bit random. i'm not an AF member, but they have paid a lot of attention to gender, including dedicating an issue of their quarterly magazine Organise to it. Concerning the gender point, I admit that my criticism is "random" in the sense that it regularly has to be made of most theoretical productions of mixed radical groups. I would disagree that theoretical antifeminism or gender blindness is "a different subject" that does not need to be addressed in a pamphlet on nationalism. But my intention was not to put down the piece, like I said I thought the pamphlet was pretty good, but from my point of view discussing nation and nationalism in gender neutral terms is not a truly radical analysis. Nira Yuval-Davis' book, Gender and Nation offers a comprehensive treatment of key issues which relate to gender, nation, and nationalism. It is an insightful and highly readable theoretical work which incorporates the most recent literature on these issues. The author begins by making a few key points about gender and nationalism: firstly, that most of the major theoretical treatments of nationalism in the social sciences (eg. by Anderson, Gellner, Hobsbawm and Greenfeld) have not taken gender into account as part of the analysis, and have tended to emphasize hegemonic western nationalisms to the exclusion of non-western nationalisms; secondly, in light of the omission of a gender analysis in this literature, she points out that nationalisms are always gendered (although not always and everywhere in the same way). In making this point, she cites the works of Balibar, Chatterjee and Mosse as exceptions to the 'gender-blind theorizations of nationalisms' (p. 3). Finally, she states that 'nationalist projects' are sharply differentiated in her book from 'nation-states', and calls attention to the fact that different 'nations' can and do exist within, across, and above the entities of nation-states, and that they rarely have a direct correspondence with these entities. One example of this is a view of the 'nation' as a de facto masculine entity, a view which does not address the differential position of women withinit, or subsumes it to the interests of the (male) nation. the pamphlet definitely doesn't do that, since far from taking the nation as a (male genfdered) given, it debunks the whole 'common sense' notion of nationhood. Another example she cites relates to differences among women: the case of elite women serving as "representatives" of women's interests - not only in terms of privileged western women speaking for all women, but also, of privileged women from less-developed nations speaking for all of the women in their countries. again, this doesn't seem to apply to the pamphlet. so what, specifically, is the problem with a 'gender-blind' critique of the nation and nationalism? 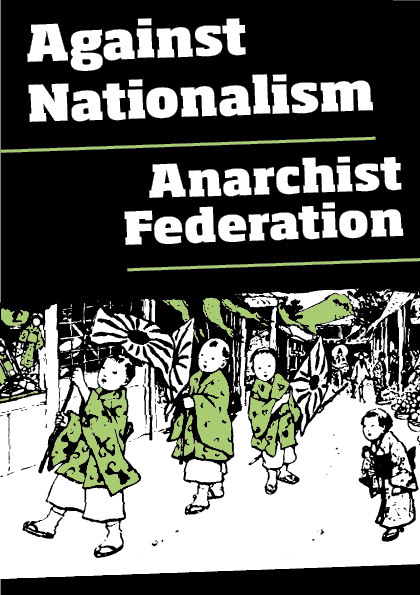 i mean in any given nationalism gender will play out differently, but since the pamphlet is rejecting nationalism per se (both "hegemonic western" and "non-western") i don't see how it's relevant - it would be if they were advocating national liberation of an implictly gendered national entity, to which the quoted text would seem to more apply. now there might be something i'm overlooking, but nothing in that rather academic precis suggests what that might be. It's a pretty short pamphlet, obviously it's not going to address everything. I agree that there's a complex intersection between gender and nationalism, ranging from the way that pretty much all militarism relies on an idea of masculinity to the way that Western countries have integrated a form of liberal feminism into their contemporary secular/anti-Islamic nationalism...but yeah, like I said, we can't cover anything. In our defence, as Joseph says, we do put a lot of time into discussing gender stuff; we have active women's and queer caucuses, and if you'd been at the London Bookfair this year (I'm guessing you weren't, if you live in France or Germany) we hosted a meeting there about "developing a revolutionary, class analysis of sexual orientation, gender identity and male dominance". Hey, I've been asked by some Israeli anarchists to translate this piece into Hebrew. Been meaning to do it for a while, but an outside impetus finally pushed me to "action". Anyway, what's AF policy regarding that? Would they like a copy? Would a link to the original piece either here or on the AF website be enough due diligence? Any other kind of copyright/copyleft notice? We'd be delighted if you translated it. We'd like a copy and we'd like a link. All our stuff is available for anyone (revolutionary that is) to use. Very good. I'm hoping that this will provide a corpus from which to generate anti-Nationalist agitation in Hebrew. Will let you know when I'm done. I appreciate it, but save the accolades for when I'm done translating, and an independent Hebrew reader confirms that it's sound. Okay, I'm done with the initial translation. I'll have to say that there are quite a few things I would have fixed in the original pamphlet, if I had the source. In particular, it mentions the docker's strike for Enoch Powell and the Ulster Loyalists striking against Northern Ireland power-sharing like it's common knowledge, while it explains the Storming of the Bastille and the Versailles Treaty with footnotes; at least for the Hebrew readership I'm aware of, it would be the other way around. Other than that, there are a few redundancies and typos. Is the AF intending to revise it anytime soon, or will that wait for the compilation of failed national liberation movements? tree, I would e-mail them a word document with the typos marked on it if you did one. feel free to add explanatory footnotes. as Steven said, put in translators notes. You are both assuming that TOJ feels confident about being well enough informed(noy saying you aren't TOJ ) maybe a link to a couple of good articles? ?